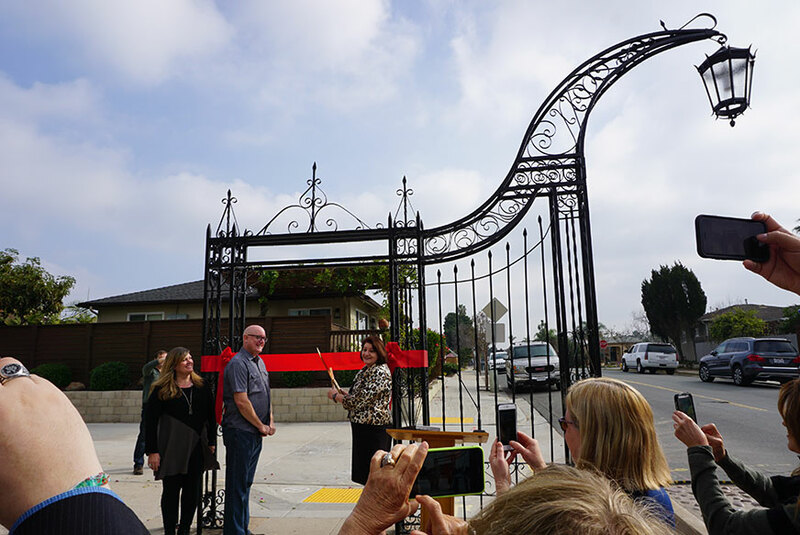 The Ribbon Cutting Ceremony held Friday, January 19, 2018 celebrated the newly restored Historic Talmadge Gates, an accomplishment of TMAD and so many years of work by countless community members. The Talmadge gates are defining historical features of our community and contribute to our unique neighborhood. Lack of maintenance and wear and tear over the past 91 years led to significant deterioration of the ironwork of the gates. Additionally, several gates had been altered from their original style, some of the giraffe light fixtures were missing, and one gate at Estrella Avenue was removed after being hit by a car. 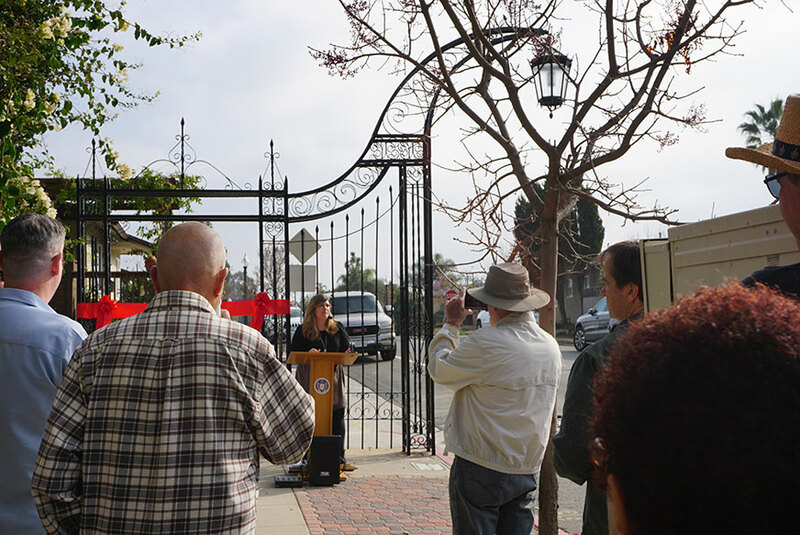 TMAD’s goal was to restore the gates to their original historic design and to replace the missing gate at Estrella Avenue. The restoration and rehabilitation of the Talmadge gates was the third Capital Improvement Project outlined in the TMAD Master Plan. TMAD’s cost of the gate restoration and replacement project was approximately $440,000, which included 6 newly constructed river rock bulb-outs to help protect the giraffe light fixtures from future damage. The City of San Diego expended an additional $330,000 for sidewalk, curb, gutter and driveway improvements, and electrical conduit upgrades, bringing the total cost of the historic restoration project to over $770,000. The restoration of the gates was a meticulous process that included the following: inspections for structural integrity and historic continuity; replacement of deteriorated iron; upgrading the electrical fixtures, including the installation of dusk to dawn light features, new wiring and glass; galvanizing, painting, and installation of new gate fixtures; preparing original sites with new footings and pedestrian ramps; and the removal and re-installation of the rehabilitated gates at all 8 historic locations and at the traffic circle. TMAD has created a preventative maintenance budget category to ensure essential ongoing care and upkeep of these historic features. See more about the history of the gates here. Kelly Waggonner makes opening remarks.